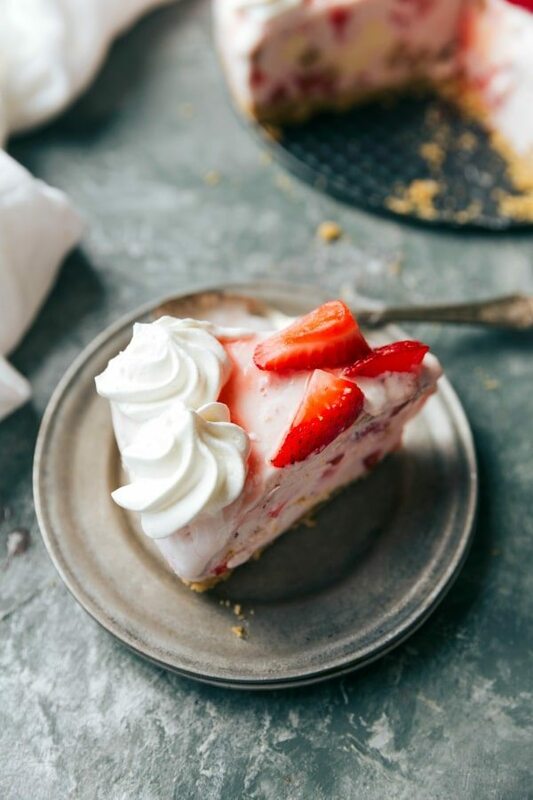 A very simple frozen strawberry cheesecake ice cream pie with a buttery graham cracker crust, a 2-ingredient ice cream and cheesecake filling, and optional sugared strawberry topping. I can’t believe it, but this is my first frozen dessert of the summer! Last year I went a little overboard (is that even a thing?) with all kinds of ice cream desserts, and this year tin foil dinners seem to be in over-load mode. Although, as much as I LOVE tin foil dinners, I’m always going to pick ice cream over dinner, so this dessert wins. ?? The toddler has become obsessed with ice cream lately, but what he hasn’t figured out is that 99% of the “ice cream” I’ve been giving him has actually been frozen greek yogurt, bananas, and cocoa powder or greek yogurt and fruit blended up, thrown in a popsicle mold, and frozen. ? When he had a thin slice of this ice cream pie you could tell he was surprised at the lack of tang from yogurt and overall how sweet it is. After having some of this pie he told me that pink ice cream is his favorite. Haha. No wonder ? This is seriously one of the crazy EASIEST ice cream desserts with stunning results (both in flavor an appearance). The crust is a simple buttery graham cracker crust, but if you’re in a pinch you can use the pre-made graham cracker crusts to make these even quicker. And then the ice cream filling is only TWO ingredients. 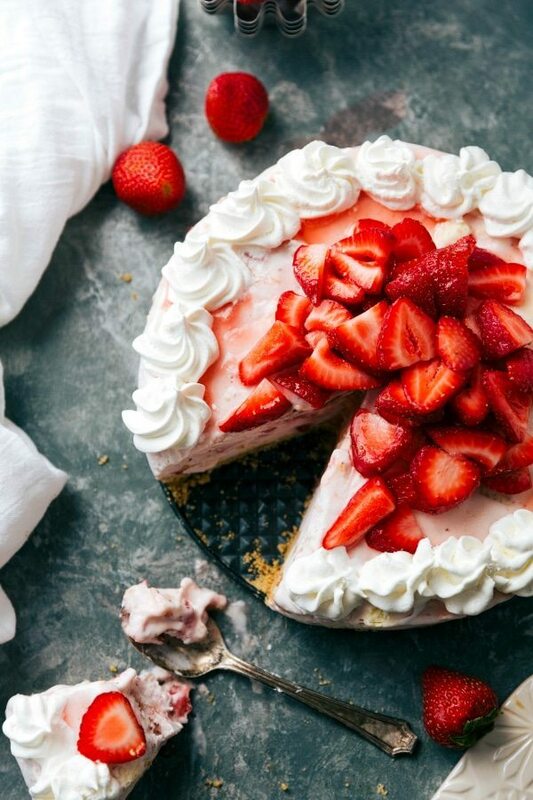 Strawberry ice cream + a pre-made frozen cheesecake. 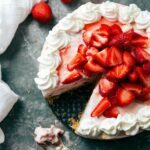 Since there are only 2 ingredients you are going to want a very high quality and flavorful strawberry ice cream since that is the main component of this pie. The cheesecake gets chopped into small pieces and stirred in with the ice cream. And then you just dump that ice cream + cheesecake into the graham cracker crust and freeze. Honestly, the whole waiting-for-the-freezer-to-do-its-job is the hardest part about this entire recipe. ? Once everything is all nice and frozen solid, it’s all about the toppings which are of course easy as well! I just used spray whipped topping and then put together some very quick sugared strawberries. This, is summer ice cream eating at its finest. ?? Prepare the graham cracker crust. In a blender or food processor, place the graham crackers and process/blend until the crackers are all crumbs. Empty the crumbs into a medium sized bowl and stir in 1/4 cup white sugar. Soften the butter and combine with the crumb and sugar mixture. Press the crumbs into a springform pan. I use a 9-inch springform pan for this recipe. Mainly press the crumbs into the bottom of the pan and then a little bit up the sides. Place the pan in the freezer while you make the filling for the pie. Allow the ice cream to soften for about 5-10 minutes depending on the temperature of your kitchen. You don't want the ice cream to get too melty or it becomes icy when re-frozen. 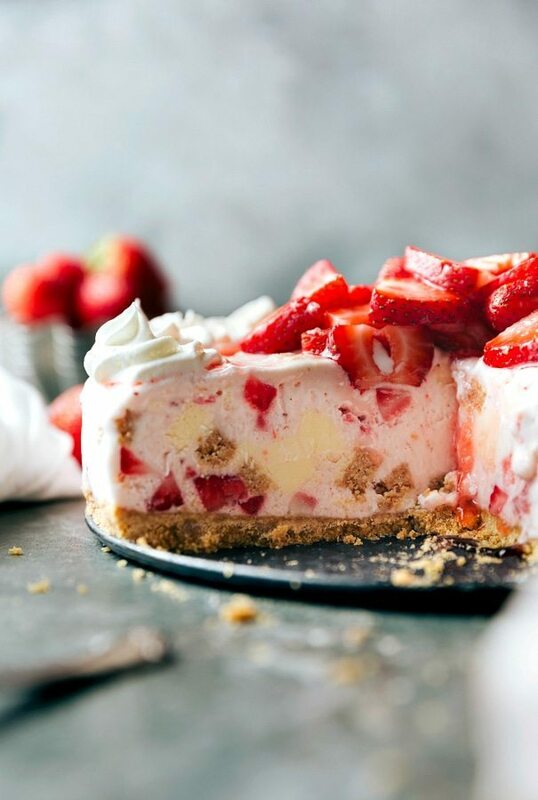 Take the cheesecake and coarsely chop into large bite-sized pieces. 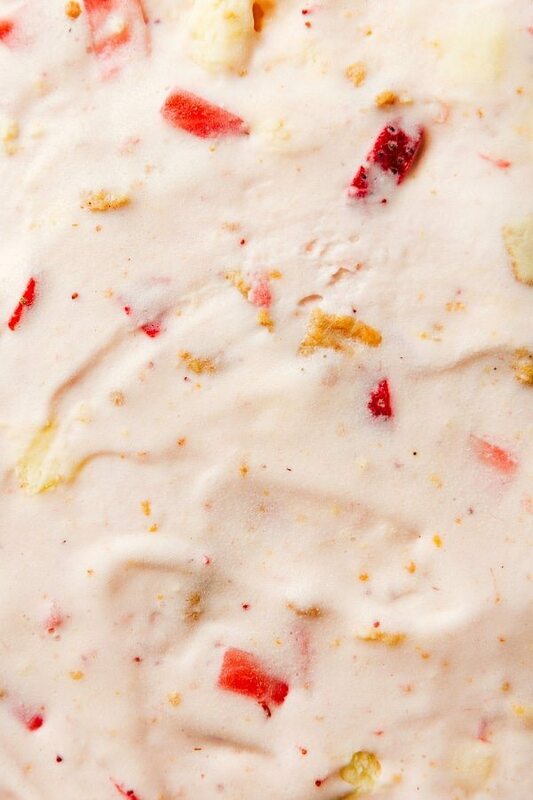 Mix the cheesecake pieces into the slightly softened ice cream. Pour the mixture over your prepared graham cracker crust. Cover and put in the freezer to set at least 8 hours or until completely firm. 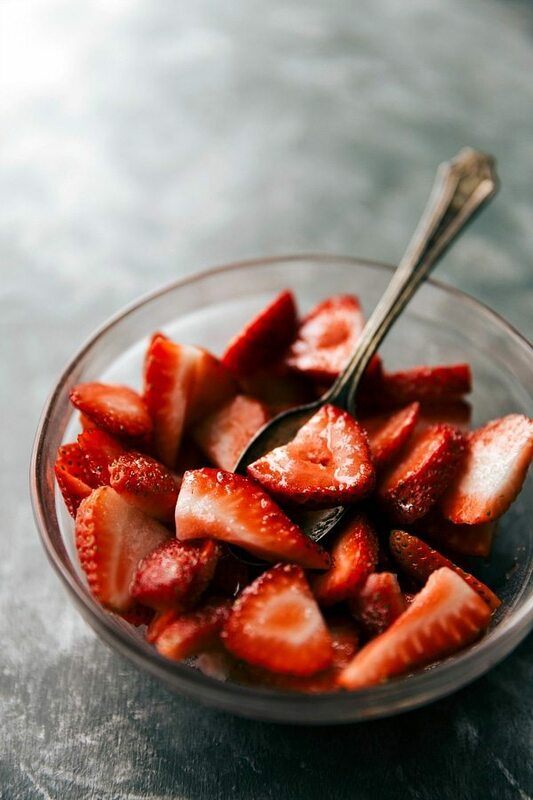 Take the strawberries and toss with the remaining 3 tablespoons sugar, zest, and juice of a lemon. Let sit for 6-9 minutes. Top the cheesecake with the sugared strawberries and the spray whipped topping on the edges if desired. Enjoy immediately after topping with strawberries. If you won't be enjoying this pie all at once, only top individual pieces with the sugared strawberries and spray whipped topping. 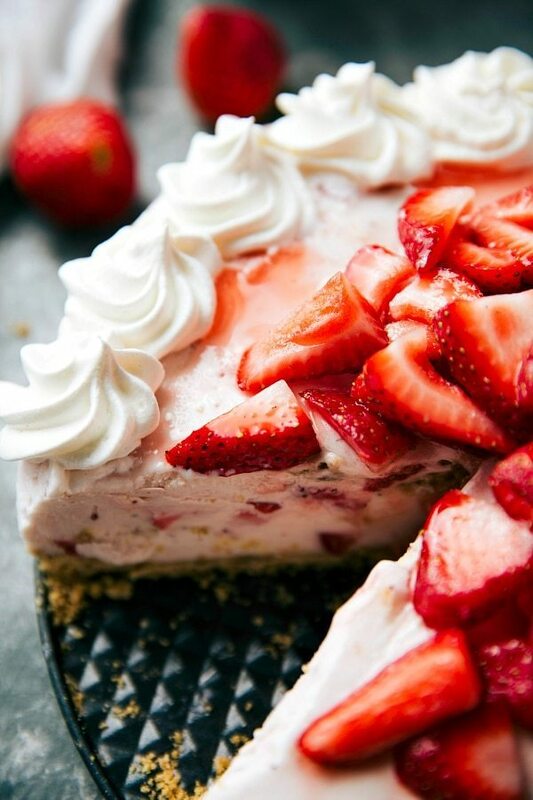 Chelsea, this sure is the most easiest ice cream cheesecake pie and the prettiest, I must say! This post and video gave me so much inspiration. Thank you!